Look, I’m not going to state that the facts out there surrounding Plaxico Burress’ shooting himself in the thigh aren’t there. It’s monumentally stupid of him to be carrying a gun illegally, only having a permit that had expired in Florida and at the very least, not applying for one in either New York or New Jersey. The fact that it went off in his pants suggests he has no clue about how to operate the safety on a gun, which is even more disturbing. Lucky for us he never ran as the GOP candidate for Senate from Illinois. Jesus, who thought this guy would make a good senatorial candidate? As long as he has the permits (which he apparently didn’t), it shouldn’t have mattered, period. The NFL is not big enough to where it should decide to take away people’s individual rights. When I witnessesd Costas’ outrage on Football Night in America, I thought, “Spoken like a man who has never understood what it’s like to have to fear for your life.” It took Tiki Barber to correct Costas, by saying that many black athletes grow up in tough situations with gangs where they are protected because of their athletic abilities, and are used to a world where you have to protect yourself — you do not trust security people or the police. I don’t know if this is reflective of Burress’ background, but if you are a black man with millionaire money, you’re going to be wary inside and outside your home. The situations are not comparable, as Burress was out on the town with teammates Antonio Pierce and either Derrick Ward or Ahmad Bradshaw (depending on who you read or hear)( but it’s silly not to think of how Sean Taylor was killed in his home and Antoine Walker was robbed near his home in Chicago. Again — those are at home, but don’t you think you would protect yourself even more when you were out of you think you are a target? Yet this impulse seems to elude everyone commenting on the stubject before everything is known. It is merely another string in Burress being a bad actor; it is part of a narrative to take missed meetings and fines and conflate them into something larger and more insidious. But the cycle hasn’t played itself out yet. 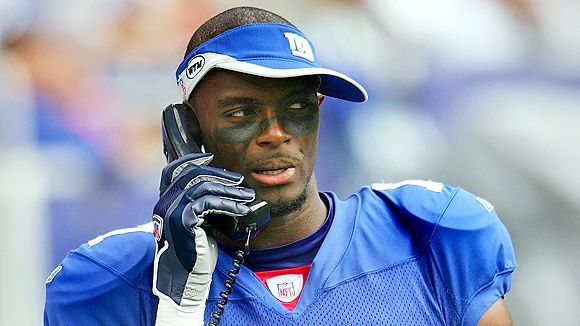 Burress still has to be charged, and we have to find out his side of the story, too. It’s asking too much to back off for a little bit though — there is blood in the water. Plaxico = Cheddar Bob from ” 8 Mile “. Now, Des, I had to Urban Dictionary that because I’d never seen 8 Mile. It works, although Plax just got broken off HARD and way worse than what he probably deserves right now.